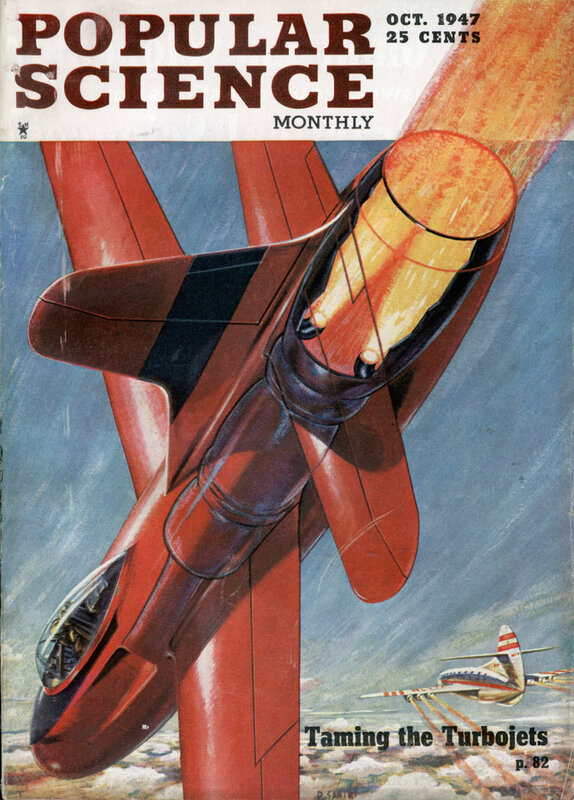 This is long before it was called Air Force One. It’s a pity the current one isn’t painted to look like an eagle. Maybe we can get Stephen Colbert to lobby for it. Luxurious new Independence replaces the travel-worn Sacred Cow to speed President’s aerial travels. WHEN the President of the United States travels, a 315-mile-an-hour plane speeds him swiftly and safely to his destination. Named the Independence, after President Truman’s home city in Missouri, the special new Douglas DC-6 cruises 100 miles an hour faster than the Sacred Cow, the DC-4 that carried Presidents Roosevelt and Truman and other high officials to 55 nations in trips totaling 431,000 miles. Extra gasoline tanks give the Independence a range up to 4,400 miles, and a pressurized cabin permits high-altitude flight. A blue-and-tan exterior design, representing the American eagle, outwardly distinguishes the flying White House from other craft of its type. Navigating equipment includes every known safety aid. A special radar set gives a constant view of fog-hidden terrain, while a radio altimeter, taking echo soundings, precludes danger of collision with mountain ‘peaks. When making overwater flights, the plane carries life rafts and life-preserver vests. The handsomely furnished Presidential stateroom occupies the entire fuselage aft of the entrance door. The President’s swivel reclining chair faces a mahogany conference table inlaid with the Great Seal of the Navigator may call weather stations anywhere on earth for up-to-minute data. Instruments above vacuum jug include altimeter, radio compass and air-speed meter. United States. A telephone handset and controls of a concealed radio put the world’s capitals at his fingertips. He may also exchange confidential messages with his cabinet advisers in Washington by radio teletype, which scrambles the messages to prevent unauthorized interception. Across the cabin, a large built-in sofa becomes a full-sized bed at night. A lounge aft of the stateroom serves as a dressing room. Passenger accommodations provide upper and lower berths for 12 persons, or seats for 24. 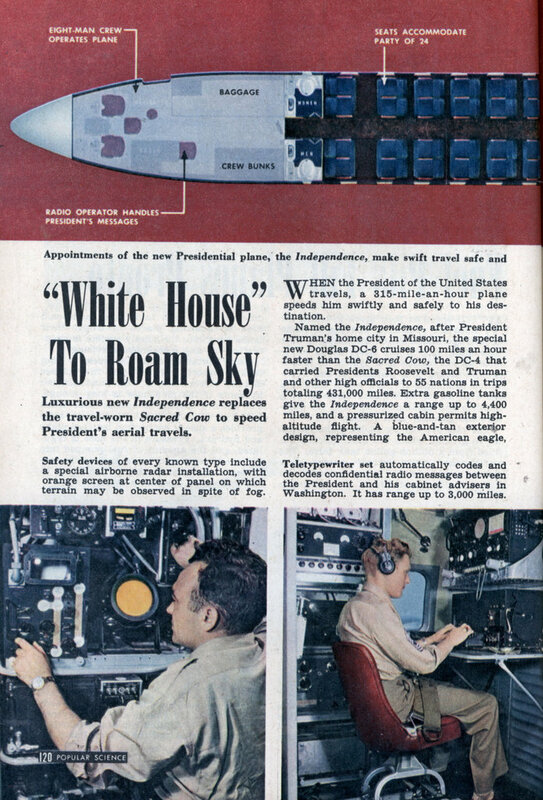 A galley with electric stove and electric refrigerator serves the Presidential party hot meals aloft. Ahh, a Colbert reference!?!? Just when i thought this site couldn’t get any better!